The 2016 New Forest Masters will be back again at the New Milton Memorial Hall for the 4th playing of this annual darts tournament. The event is run by New Milton based darts company The Darts Performance Centre and sponsored by Ringwood Brewery! The main tournament is open to all – Youth, Ladies and Men players. This year, for the first time, there is also a stand- alone Ladies event; The New Forest Ladies Masters. The doors open for all at 10am with the action starting at 11.30. Entry is £10 and you can pay on the day. Also a full licensed bar and refreshments and snacks available. You are also welcome to come along and spectate. Last year top PDC star Simon Whitlock played but players of all standards compete, from pub to pro who battle it out for the £400 first prize. 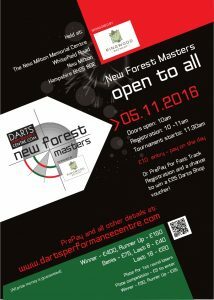 The New Forest Masters is on Saturday November 5th, so we are expecting fireworks on the oche!